Israeli soldiers attacked, Friday, the weekly procession against the Annexation Wall and Colonies, in Kufur Qaddoum village, east of the northern West Bank city of Qalqilia. Morad Eshteiwi, the media coordinator of the Popular Committee in Kufur Qaddoum, said the soldiers invaded the village, and attacked the marchers, shortly after the procession started. There have been no immediate reports of injuries or abductions. He added that the army fired many rubber-coated steel bullets, gas bombs and concussion grenades, in addition to using a surveillance drone to film the protesters. The army also invaded the homes of two residents, identified as Hakam Khaldoun and Zohdi Eshteiwi, before occupying their rooftops and used them to film the protesters. 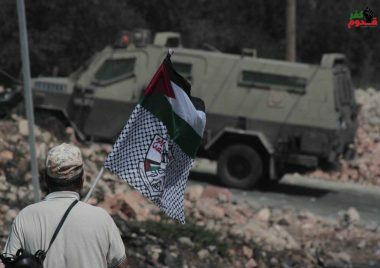 The Palestinians in Kufur Qaddoum have been holding weekly protests for the fourteenth consecutive years, demanding the army to reopen the main road which was completely blocked to enable easy access to the colonists, living in Kidumim illegal colony, which was built o illegally-confiscated Palestinian lands.